This year, we’ve seen a lot of people and consumers becoming more aware of the impact that they have on the environment and the world around them. This newfound sense of responsibility for our actions has been a needed wake up call for many, and we view it as a very positive movement. As many people become more aware of the environment, sustainable and eco-friendly solutions to everyday problems and tasks are beginning to crop up to fill in the gaps. We want to support those that are choosing to live a more sustainable life, and we’re excited about the eco-friendly architectural trends that are coming up to meet this need. Using eco-friendly building materials is nothing new, but a lot more consumers are becoming aware of the difference between these eco-friendly building materials and their not so sustainable counterparts. Recycled wood and lumber, insulation used from recycled fibers, and upcycled furniture are just the beginning when it comes to eco-friendly buildings. We’ve seen an increase in requests for eco-friendly materials, and we’re excited about the creativity we’ve seen and experienced this year as a result of this. There are few things that are better for the environment than the addition of new plants. Even just planting a single tree in your yard can improve the air quality in your neighborhood exponentially. But that isn’t the only place you should have a bit of green. We’ve mentioned before how green office spaces are becoming more popular lately. Green walls, vertical gardens, and garden rooftops are becoming increasingly popular. 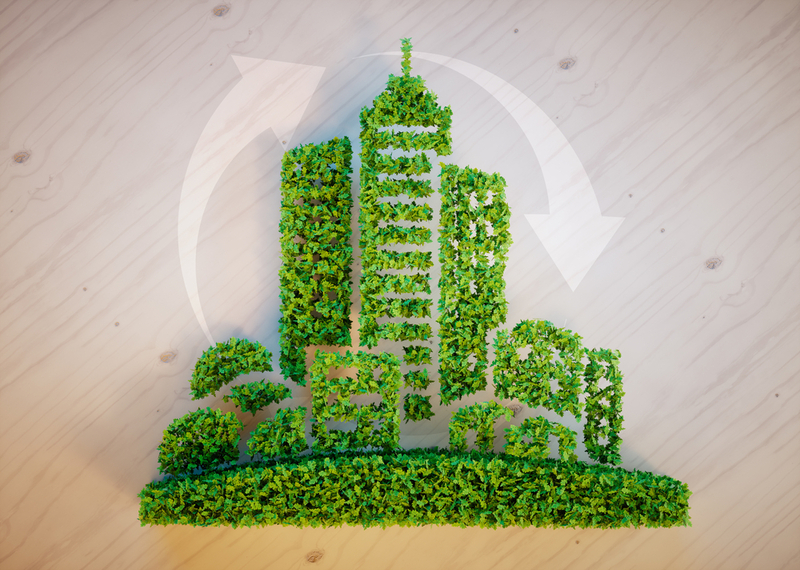 Being able to sustain and manage the things within your building or home is important, and goes hand in hand with eco-friendly buildings. Requests for smart home features has gone up, meaning that it’s easier for you to control and see how much energy you’re using and conserving. You can check and make sure all the lights are turned off, whether you’re present in the building or not, just from your phone. These smart features are great additions to your sustainable buildings, as they help you be more conscious! The same smart features can apply to air conditioning, heating, fridges, and even windows. You won’t waste as much as energy, and you’ll feel good about the impact you have.